Downsize Your House to Get Out of Debt. The Total Guide to Success. The Total Guide to Downsizing Your House to Get Out of Debt. When we downsized our house a little over 2 years ago we also did it with the desire to begin living a more intentional life. Up to that point in our lives, we lived without a budget or any real purpose for our money. We took vacations when we had extra money and had hardly anything in savings. Downsizing for us also meant upsizing our money. It meant building a savings and making a conscious decision to tell our money where to go (just like Dave Ramsey told us to.) So many people find themselves in the same boat as we did. Spending too much on useless things, spending too much money and time maintaining a house and all the things inside. So, I’m here to spread the word that it is possible to downsize your house and debt at the same time. You can totally transform the direction of your life and while it won’t be easy, it will totally be worth it. *This post may contain affiliate links. I may make a commission off anything I recommend but all opinions are my own. Some people may not want to downsize but need to in order to financially save themselves. Others (like myself) just want to be done with it all. I wanted to shake that big house and all it’s maintenance like a dog shakes off water. We also were terrible at managing our money and were probably spending more than we should have on our monthly house payments. I say probably because I couldn’t even tell you…that’s how bad I was at keeping track of our monthly income. Anyway; let’s talk budget breakdown. Are you spending more than 25% per month on house costs? If you are spending more, how much more? Where are you spending most of your money per month? — Does it align with your life plans and values? Another major thing that is often wasted on a bigger home is your time. When we first moved in we spent an entire summer working the yard, painting and redecorating. I honestly don’t know if we spent more money on all the repairs or more weekly hours doing labor. If you are wanting to downsize your house, I’m guessing this is a big part of the reason why. It was for us. Not only were yard work and house repairs exhausting, but just the daily also tidy-up and bathroom scrub down was about to drive me insane. How much time do you spend a week cleaning/maintaining your home? Do you pay additional funds for a service like cleaning or yard work? Be sure to consider these costs in your house budget. Based on your time and budget, now is a good time to make a game plan. If you are strapped for cash and strapped for time, then you are probably a good candidate for a downsized house and upsized budget. Now is the time to figure out if you need both or if just one area might need a little bit of work. If you are all ready to jump full-swing into this thing, then I want to tell you how we did it and survived. 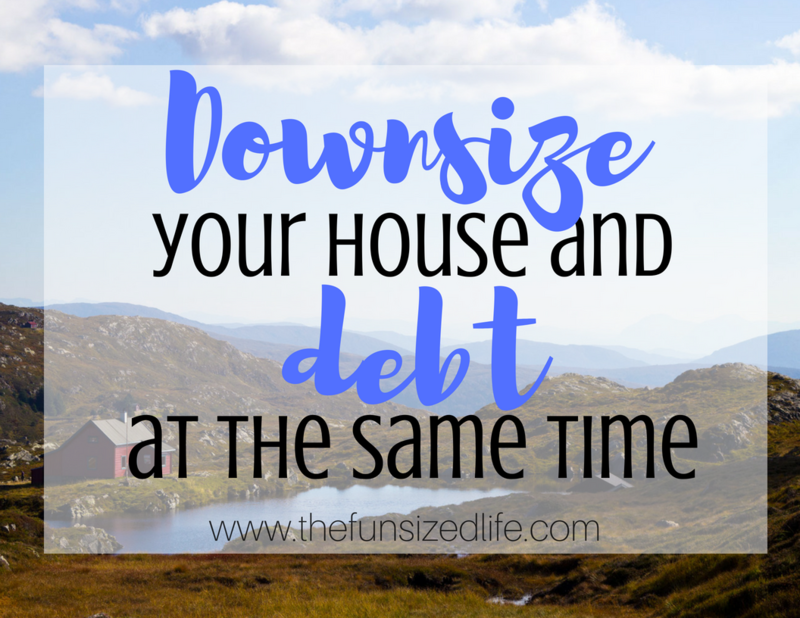 Downsizing a house and paying off debt at the same time. When you get started, it’s super important to know just how “in it” you are when it comes to debt. You are going to want to know exactly how much debt you’re dealing with. Even though you have been making payments, you might not realize just how much you actually have. This is your current situation. It might be harsh, don’t worry, I’ll talk you through it. **If you figured out how much you should be spending on monthly housing costs after downsizing, consider adding the difference to your existing debts. Having a $500 difference is huge, but if you can swing it, it will help you big time with paying off this debt faster than ever. So let’s talk about how to get started paying off debt faster. Do you need a loan to pay off debt? We used the Dave Ramsey Debt Snowball to pay off our debt. I talk all about it in my post, Pay off $6,000 in 6 Months with the Snowball Method. What I did originally put in that post (it has since been added) was that we wound up taking out a small loan in order to help lower our monthly payments and the amount we were paying in interest. If you are in the same boat, The Loan Exchange Online is a great source for getting a lowered interest rate! There are several smart reasons for taking out a loan, but when it comes to debt payoff, using a loan to lowering your interest rate and helping you to consolidate debt are the two that will serve you the best. Once you have all of your payments in place, the Debt Snowball says you should star with the smallest monthly payment and add $200 to it. For example: If your minimum payment on a store credit card is $30 per month, you will now make a payment of $200 per month. Now that you are paying an additional $200 per month to your smallest loan, keep paying your regular minimum payments on all of your other debts. Once you have paid off the smallest debt, it’s time to take all that money and begin applying it to your next smallest debt. For example: You were paying $230 per month toward credit card #1. Credit card #2 has a minimum monthly payment of $50. You will now apply that $230 to this $50 for a total of $280 per month. Now keep this method going until you have managed to pay off your all your debts. For a more detailed description (and free printouts) check out my post that focuses on the Debt Snowball Method. Another great idea if you do plan on downsizing your house is to find ways to make money during your downsize that you can put toward your debt. If all else fails…donate, donate, donate! It’s really as easy as that. Get a smart budget in place and stick to it. I highly recommend constantly finding new ways to make extra money to throw at your debt. We did this to help pay for our vow renewal and afterward, I had a new determination to do it for our debt as well. It can be a long, hard road, but it is also really liberating to pay off your debts one step at a time! We are finishing up our final $5,000 before building a savings and eventually tackling our mortgage! You can follow our journey on YouTube to see how we’re doing with debt payoff and to get some other tips and updates from us as well.